Hamilton student elected at Badger State - Hamilton School District. 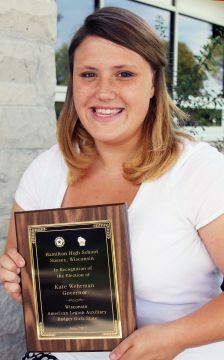 Hamilton High School senior Kate Wehrman was elected governor of 2012 Badger Girls State held this summer at the University of Wisconsin – Oshkosh campus. Wehrman was one of 711 delegates who attended the weeklong session sponsored by the American Legion Auxiliary. After studying government processes, organizing into two mock political parties and conducting campaigns, Badger Girls State participants elected fellow delegates for local, county and state offices. Wehrman was sworn into office by Wisconsin Supreme Court Justice Shirley Abrahamson, delivered her acceptance speech and performed duties as governor at the final assembly. She was also a guest in July at the Wisconsin American Legion Auxiliary convention in Middleton. Badger Girls State began more than 70 years ago and emphasizes the role of responsible citizenship in good government. The American Legion Auxiliary designed the nonpartisan, nonpolitical program to train future stateswomen in the science of government. Girls State program goals are to develop leadership and pride in American citizens, instill a greater understanding of American traditions and stimulate a desire to maintain the democratic government process.